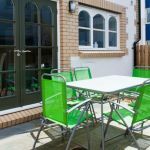 Ideally suited in Aberystwyth town centre, 80 metres from the beach and close to pubs, restaurants, shops, 24-hour convenience store and the popular seafront where many Bikers meet. 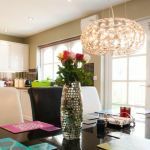 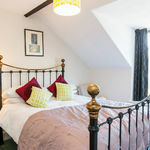 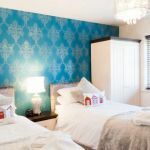 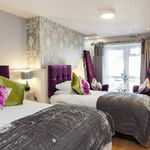 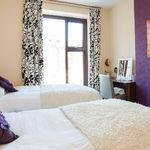 Nine comfortable and modern bedrooms, comprising 2 doubles, 6 twins and a family room, decorated and furnished to a high standard with colour tv and tea and coffee facilities. 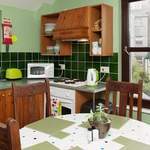 On a room only basis, at great rates with use of the fully equipped kitchen, wi-fi and laundry facilities. 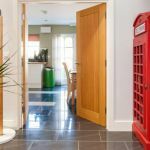 The hallway and landings are themed with pictures of Welsh history. 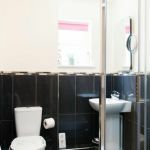 Also a new one-bedroom apartment and a 4 star luxury house with en-suite rooms, available to rent on a nightly or weekly basis, adjacent to Maes-y-Môr.